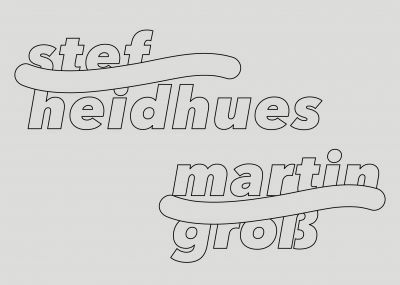 The work of Martin Groß encompasses drawing, texts and installations. While in the past the artist has focussed mainly on structures and space within drawings, his artistic interest has now increasingly shifted towards observations, impressions, figures and texts relating to culture and everyday life. Groß himself describes his works as 'landscapes', though he does not mean studies of nature in this context. Instead, he is referring to informational and social landscapes, which to him form systems by which to transfer information into images. In this process, language and text play a major role. Personal recollections of moments, quotes, transcripts and samplings serve as the basis for drawings or as the material for wall pieces or works on LED boards. In the drawings, which Groß produces with industry painter on paper, these elements mesh with a formal language that is characteristic for the artist and which challenges the eye of the observer. This language contains elements of the digital but still seems to be placed on the paper in an impressionist manner. Meanwhile the coloring is determined by the industrial production of the markers. The color scale is limited only to the primary colors as well as black and white, which leads to clear boundaries that dominate every variation. There are lines and surfaces. Lines intersecting with surfaces, and surfaces encountering lines. These lines seem to visualize perspectives, directions, and possible movements that were already carried out or that may still occur. They indicate a shifting. But by no means do the shapes developed in Stef Heidhues’ works appear two-dimensional. On the contrary, the lines, materialized by steel rods or neon tubes, lay trails and traces. To her steel frames and fittings the artist adds material surfaces made, for instance, of leather or silicone that are mobile or that suggest mobility. It is by way of these dimensional maneuvers that Heidhues’ objects and installations define the space encountered and create an intermediate space, a space in between. Heidhues’ work process begins with drawings through which her ideas undergo a process of careful review and persistent revision until they achieve coherence. It is on the basis of these drawings that the artist develops her three-dimensional works. As models and starting points for her works she chooses everyday objects, architectural and social space, as well as the interaction taking place there. The essence of her works is revealed through a process of abstraction and progressive reduction. Empty billboards or the vacant carapaces of neon signs are examples of her points of departure. Those empty frameworks limit and define a specific space that is no longer or not yet occupied. For Stef Heidhues it is theses spaces’ openness, the fact that they are not reduced to one single meaning, that makes them valuable. “The moment there is a frame, but the space inside is not yet occupied, everything is possible,“ the artist explains. Yet the works can only be completed by the viewers’ gaze. Heidhues’ spatial clues and the leads she offers invite observers to begin a dialogue with the artworks independently and individually. Maybe they are even able to embrace the works’ interstices and empty spaces as a manifestation of desire. Because the absence is present, a field of tension opens up that is characterized by resistance and obstacles, yet where we can wander about. Her works do not let us go: They provoke us to both enter into a dialogue with them and to confront ourselves. In her video installation ‘UNAMERICA – Relocating memories’ Luise Schröder deals with the commemoration of the internment of Japanese-Americans at the former War Relocating Center in Manzanar during World War II.Manzanar is situated 350 km north of Los Angeles. Annually, since 1973 on the last weekend of April survivors, their relatives, as well as sympathizing groups come together to commemorate the forced displacement and detention of more than 10,000 people in Manzanar authorized by president Roosevelt through the Executive Order 9066. The relocation and detention was carried out after Pearl Harbor was attacked in December 1941 and the USA entered World War IIuntil 1945. Nationwide 120,000 people were displaced and interned aiming to protect the country from possible spying and sabotage. These political decisions had been a taboo for a long time, until Manzanar was declared a national memorial site in 1985. Besides, the internment carried out there was officially admitted as racist and illegitimate by the government. In her video Luise Schröder focusses on different historical, political and visual narratives with the purpose to understand how and in which way the historical events are represented and reconstructed today. She investigated the material for her work during her research stay at Villa Aurora in Los Angeles in 2016. In her multimedia works Luise Schröder deals with the reconstruction of history in the present. She questions how (in-)official remembrance is affected by political, social and media developments. The historical photos from Manzanar are taken by Ansel Adams and Dorothea Lange who worked for the War Relocation Authority. Their pictures, which can be received ambivalently, were either published, or censored by the Authority. At a later stage they were also used for documenting the internment. The photos show the life in Manzanar from an external perspective.